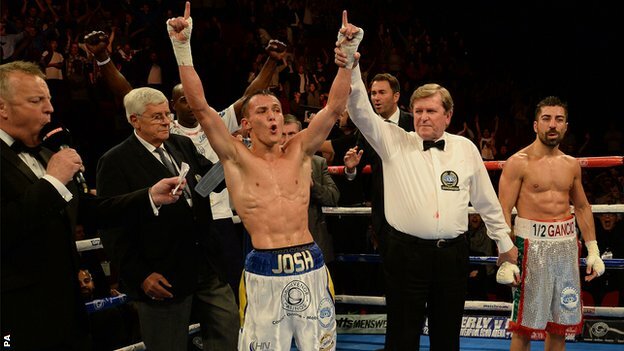 Josh Warrington stopped Italy's Davide Dieli in the fourth round to claim the vacant European featherweight title. Warrington, 23, who also holds the British and Commonwealth belts, secured the biggest victory of his career in front of his home supporters in Leeds. He is now unbeaten in his 19 professional fights and picked up his third belt in 12 months. Dieli, 35, was floored in the fourth round before referee Manuel Oliver Palomo stopped the fight soon after. Veteran Dieli, who had won 15 of his 18 bouts, struggled to keep pace with the Englishman and was overpowered from the start. Making use of multiple combinations, the Leeds man's work rate troubled the challenger, who was knocked down in the fourth and then stopped. Former two-weight world champion Ricky Burns made a triumphant debut in the light-welterweight division, securing a 79-71 points win against Frenchman Alexandre Lepelley. Burns, 31, had lost his last two fights and decided to move up to the 140lbs division, but the Scot looked unconvincing at times in the eight-round contest. He dropped his opponent in the opening round but struggled to impose himself and, although he deserved his victory, was far from his best. Burns, fighting outside of Scotland for the first time since November 2011, made a strong start and was the busier fighter in the opening round, landing a couple of crisp jabs before felling Lepelley with a hard right near the bell. Lepelley had his best round in the fourth, landing a hard shot that drew gasps from the crowd, but from then on the bout descended into a cagey scrap, with neither fighter asserting themselves in the closing rounds as Burns gained the 37th victory of his 42-fight career. Earlier in the evening, super-middleweight Callum Smith, whose brother Paul suffered a controversial points defeat against Germany's Arthur Abraham in their WBO super-middleweight bout last week, defeated Rafael Sosa Pintos with a third round technical knockout. Derby's Dave Ryan claimed the vacant Commonwealth light-welterweight title, after recording a majority points win over Huddersfield's Tyrone Nurse. And Blackpool's Bryan Rose, fighting for the first time since losing his light-middleweight world title shot to Demetrius Andrade, recorded a first-round knockout victory over Argentina's Ignacio Lucero Fraga.